Nintendo's Legend of Zelda franchise has been through many iterations since its 1986 debut. In 1993, Link's Awakening became the first handheld Zelda, and 1998's Ocarina of Time was touted as Zelda's breakthrough into the 3D realm. In 2007, Zelda finally made its way onto the Nintendo DS, in the first ever touch-controlled, online Zelda, Phantom Hourglass. That's a lot of firsts, but it's clear after a playthrough of the game that it's also the first Zelda game in a while to really let me down. Those who protested the cel-shaded "Celda" style of Windwaker (2002) will be disappointed to know that Phantom Hourglass continues the motifs of that game, right down to its story and visual style. Link is now living a peaceful life again, sailing the seas with Tetra and her pirate gang. Soon, however, they come across the infamous "Ghost Ship," and Tetra is attacked and kidnapped while within it. In order to save her, Link must team up with a fairy named Ciela and an unscrupulous sea captain named Linebeck. Of course, the game pans out almost exactly like every Zelda you've ever played. There are magic stones, a mystical sword, and nine dungeons to complete. Luckily, this game takes a leaf out of Majora's Mask's book and creates a story that adds to the previous game rather than simply mimicking it. This time, you are riding in a boat with two other companions, and the plot ends up being much more about side characters and their personalities than any Zelda since Majora's Mask. In terms of truly new additions, Phantom Hourglass relies heavily on touch control, to the point where the face buttons never actually perform any significant functions in the gameplay. Link moves toward wherever you point on the screen (a la Animal Crossing), attacks when you pull the stylus across the screen, and uses an item when you tap it on the top-right. That means an almost excessive amount of tapping, which makes one wonder why the face buttons aren't used more. While it's cluttered and hard to learn, I won't deny that it is a refreshing experience for longtime Zelda fans. Puzzles, minigames, and even driving Linebeck's ship are all controlled by the touch screen, often to great effect. Phantom Hourglass even mixes up the format a bit with boss fights stretching across both screens, adding a surprising new dimension to the game. The other important addition is the use of the touch screen as an interactive map, where the player can take notes and draw pathways: a truly brilliant use of touch control. The dungeons can often become too easy, a common complaint about the game. However, I didn't find many problems with the difficulty curve, since there practically is none. Instead, there is a sort of difficulty scatter-plot, without any real feeling of increasing difficulty. Exacerbating these problems is a massive, tiring central dungeon. Players will have to brave this terrifyingly long (and timed) fortress at least six times in the game, and since each run is linear, Link restarts at the entrance for every 10-to-20-minute run. Phantom Hourglass also serves as a reminder that the DS has indeed reached a plateau when it comes to graphical capabilities. The game (rendered in full 3D) looks competent, but not spectacular, just as we have seen with previous first-party DS endeavors like Animal Crossing, Mario Kart, and Metroid Prime. Oh, and I just couldn't get over how downright UGLY Link's bug eyes look in this game. Finally, Phantom Hourglass packs some multiplayer punch as well, including the touted online mode, the first of any Zelda title. The battle mode is fun, if it sometimes feels less like a Zelda game and more like a strategy game. Sadly, only two players can play at once, unlike the other prominent multiplayer Zelda, Four Swords. I sadly didn't have a chance to play the online component. Phantom Hourglass is not the revolutionary move to the DS that Nintendo had hoped it would be. It uses the touch screen for nearly everything, and while sometimes this results in a cluttered interface, there are many, many moments when players will find themselves delighted by the brilliance of a puzzle or the ease of control in a certain area. 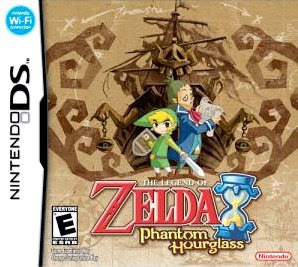 Some may decry difficulty inconsistencies and dungeon design problems, but a charming storyline and fun puzzles make Phantom Hourglass a highlight of the Nintendo DS library and a worthy, if imperfect, successor to the Zelda legacy. Ani-Gamers Podcast #054 – Why Do Guns Have to Exist?